This rewarding walk provides plenty of variety and some small challenges for the keen walker; Steepish valley sides require some energetic climbs, and the three crossings of the Brook usually can’t be achieved without getting your boots/feet wet. 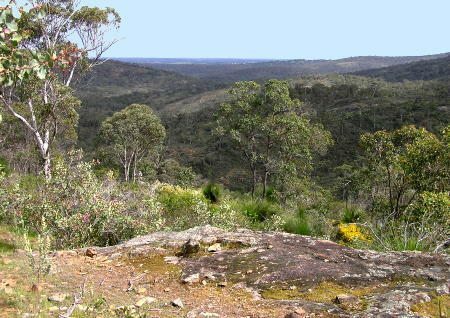 The hill climbs also provide many excellent sweeping views across and down the valley to the Coastal Plain and along the Swan River valley in Walyunga NP. An enjoyable optional scramble up a rocky side gully to visit a seldom-visited waterfall is just one of the highlights. Wooroloo Brook drains a sizeable catchment area (536 sq km) and during a wet winter it flows quite swiftly in its lower few kilometres, dropping about 50m overall as it passes through its narrow, quite rugged valley westward of the bridge at O’Brien Road (Gidgegannup) to its confluence with the Swan River in Walyunga National Park near the western edge of the Darling Range. The walk is centred around this lower section of the Brook. This is a very rewarding walk route which provides plenty of variety and some small challenges for the keen walker; These include the steepish (in places gorge-like) valley sides which require some energetic uphill climbs, and also three crossings of the Brook which usually can’t be achieved without getting your boots and/or feet wet! The hill climbs also provide many excellent sweeping views across and down the valley to the Coastal Plain and along the Swan River valley. A short optional but very worthwhile diversion involves a scramble up a rocky side gully where small waterfalls should be on display in winter. The walk includes only short off-track sections because much of the valley slopes and the banks of the Brook are blanketed in quite dense shrublands which can make off-track walking in the area very frustrating and difficult, though the route does include one short section as a sample! 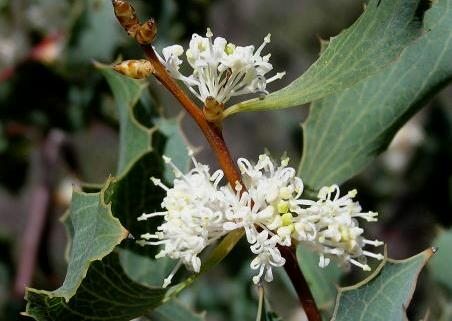 –The shrublands include Trymalium sp. 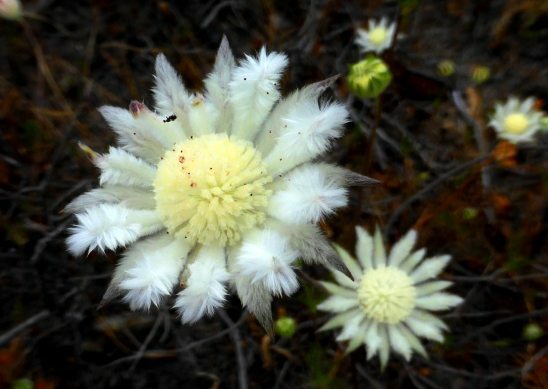 (similar to Karri hazel), Calothamnus sp. 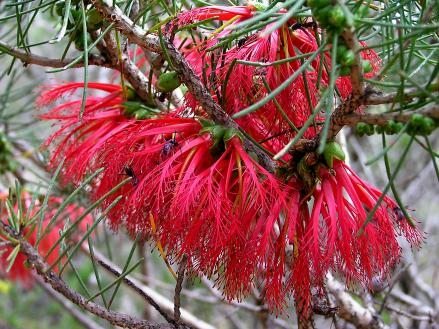 (One-sided bottlebrush), and various Grevilleas, Hakeas and Melaleucas etc. 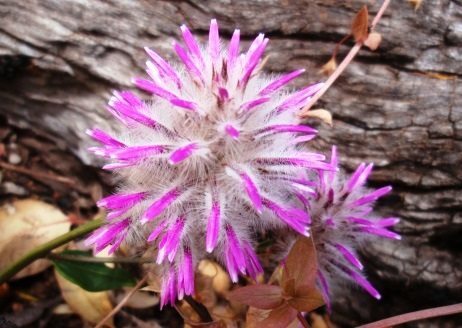 These might be a challenge to the off-track bushwalker, but in spring they offer a rich and varied wildflower display. 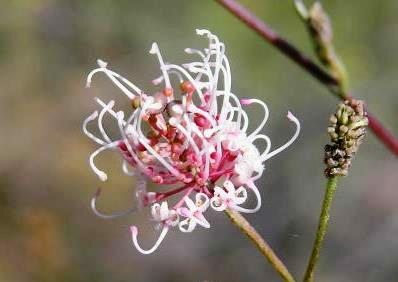 Apart from the extensive shrublands the walk route also passes through mixed jarrah, marri and wandoo forest on and around the hill tops, and through heathlands surrounding the scattered granite outcrops. 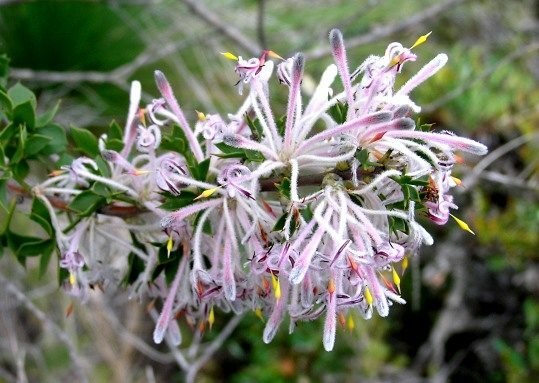 Sadly, along the banks of Wooroloo Brook, as occurs along many other rivers and streams near the Darling Scarp, the invasive pink- to red-flowering weed Watsonia is gradually taking over areas previously occupied by native vegetation. 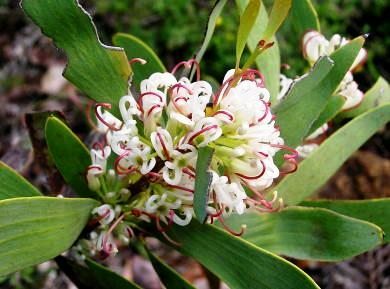 Together with the Avon Valley National Park and Paruna Wildlife Sanctuary to the NE, Walyunga National Park is an important area for native fauna conservation along the Swan-Avon Valley. 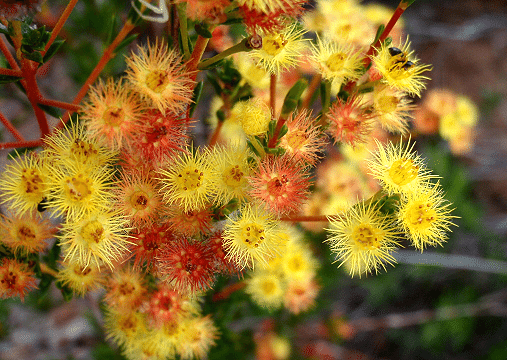 Animals re-introduced by DBCA/AWC include the tammar wallaby and black-flanked rock wallaby. In recent years however, in the absence of serious culling, feral goats have reached damaging, plague proportions. 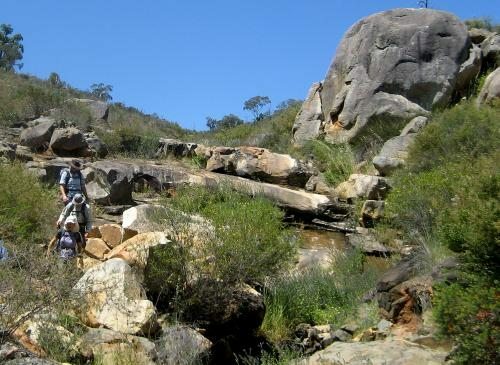 To avoid off-track section – The main walk is relatively short and not difficult for a fit and experienced bushwalker, but others may prefer to avoid the off-track section (between ‘7’ and ‘9’). That can be easily avoided by commencing the walk route in the reverse, anti-clockwise direction via waypoint ‘50’, ‘49’ etc around to ‘19′ and then following the good track up the hill from waypoint ‘19’ to rejoin the ridge near ‘38′. Then retrace the route from there back to the Start point. To avoid crossing the Brook – If the Brook happens to be high and/or fast and unsafe to cross when you visit (see Alerts / Issues) you can follow the Option in the Route notes below which allows all three brook crossings to be safely bypassed, but adds 3km to the total walk distance. Other options are easily possible by commencing the walk route in the reverse, anti-clockwise direction and later using some combination of the alternative tracks during the return leg. 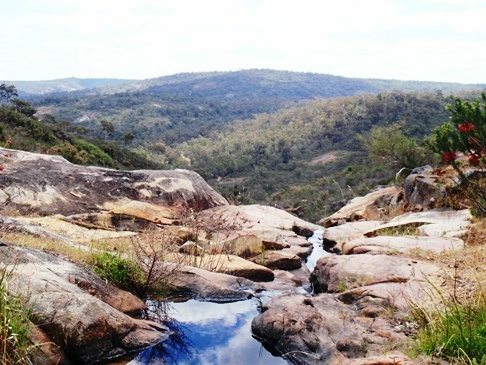 Walyunga Lookout extension – If you opt to avoid the river crossings as above, you could also vary the route to link into part of the eastern section of the Walyunga NP Walk route (to Walyunga Lookout) in the NW via ’28A’ and/or ‘26’. – Walyunga Lookout carpark at end of Ewing Rd in the north (off O’Brien Rd) – then link into the walk at ‘26’ or ‘28A’. The eastern part of the walk route can then be bypassed by following a vehicle track up/down the hill between ‘19’ and ‘38’. Head south from the Start point (waypoint ‘START’) along the rough vehicle track along the eastern bank of Wooroloo Brook. The track soon climbs to meet O’Brien Rd (at ‘1’). Continue southward on O’Brien Rd to ‘2’ then turn right (west) to leave the road and walk off-track down the roadside embankment and through a short section of forest and light scrub to reach a track near DoW’s ‘Karl’s Ranch’ river level monitoring station (at ‘3′) on the bank of the Brook. Get a view of the Brook from a nearby potential crossing point at ‘4’, 30m downstream of the monitoring station. Return past the monitoring station and follow the track SE-ward uphill. The track forks near ‘5’. Take the right-hand fork (which parallels the nearby O’Brien Rd) due south through shrubland flanking a stream gully for about 400m to a Y-junction at ‘6’. Follow the right-hand fork gently uphill (WNW) to a ridge and clearing in the forest at ‘6-1’, the site of a former picnic area. Follow the track SW from the clearing to reach a W-E track. Cross the track and continue to a nearby roughly parallel track at ‘6-2’. Turn left to follow this track for only about 50m back onto the crest of the ridge. Then veer right to head generally southward up the steepening ridge via ‘7-1’, ‘7-2’, initially navigating through or around some initial small patches of shrubland, then via ‘7-3’, ‘7-4’ through mainly open woodland, gaining some good views NW-ward across the main valley. Then veer right (SW) and traverse the head of a gully via ‘8’ and soon reach a good vehicle track at ‘9’ on a flatter laterite surface. Turn right to follow the track westward across the gentle hill top for about 600m (passing a side track on the left at ’10’). The track then zigzags down the steepish hillside (via ‘11’, ‘12’, ‘13’), gaining good views down the Wooroloo valley. (An optional brief off-track short-cut can be taken from ‘11’ to ‘11-1’.) The track flattens near the Brook and then reaches a boulder-filled side gully where the track has been washed away (at ‘14’). At this point, for a very worthwhile optional diversion, head southward off-track to boulder hop and scramble up the side gully for about 250m or more, passing large ‘sentinel’ rocks (at ‘14-1’) and a small pool (‘14-2’), to reach the foot of a 10-15m high waterfall/cascade (at ’14-3′). (This would likely be more impressive in winter if some of the water flow was not blocked by several large dams in farmland further upstream.) After exploring the area around and possibly above the waterfall (as far as a granite ledge at ‘14-4’), return back down the gully and follow toward ‘15’ the partly overgrown track on the west side of the gully to find a shallow crossing point across the Brook (at ‘16’). (Or see Option below if the Brook is flowing too strongly to safely cross.) After crossing the brook, pick an easy way through the few metres of shrubland on the north side to find the continuation of the track near ‘16-1’. 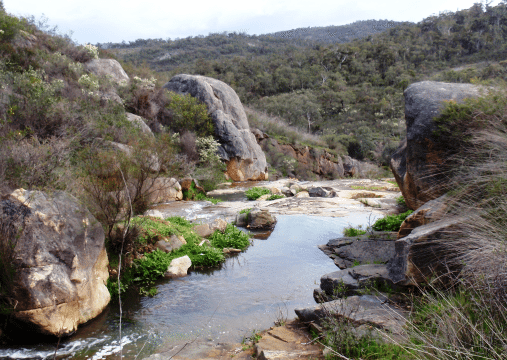 (As a very short diversion, visit the nearby granite outcrop which almost crosses the Brook from the north side and provides a pleasant spot for a rest while maybe also ‘re-booting’ after the crossing.) Follow the track generally NW-ward (via ‘17’). Pass a side track (at ‘18’) which heads northward uphill and turn left at a T-junction at ‘19’ and soon descend to cross Wooroloo Brook at ‘20’ via a shallow ford over a (very slippery!) smooth granite slab. (Note: Keep back from the lip of the small waterfall which drops over the edge of the slab and wear either your boots or change into suitable sandals with a good grip sole for the short crossing. A walking pole is also a useful aid to steady yourself against water flow.) Follow the track around the southern side of the river for about 1.5km (via ‘21’, ‘22’) passing into Walyunga National Park at a gate in the Park boundary fence (at ‘21’; Note: The old ‘CALM’ sign on the gate, warning of feral animal shooters in the area “today”, appears to have been left in place and forgotten for a long period! (Judging by the numerous feral goats in the Park there has not been a lot of desperately-needed culling in recent times! The sign is presumably no longer applicable but unfortunately may confuse visitors. You must use your own judgment whether it is safe to proceed.) On reaching ‘23’, turn right to follow the track down to the Brook to another crossing point (at ‘23-1’) which is at about the halfway point on the walk. After the crossing, head northward up the quite steep hillside via ’23-2′ and ’23-3′, gaining almost 230m in elevation (taking the left fork in the track at ‘24’ and then the right-hand fork at ‘25’ to continue uphill). The hill climb provides some excellent views, initially back up the Wooroloo valley. Consider having a rest stop under the wandoo trees just to the lift of ‘25-1’, to enjoy the good views down to the pools (and railway) along the Swan-Avon River which cuts through Walyunga National Park. Follow the right-hand fork in the track at ‘26’ and then (after ‘25’). At ‘26’ take the right fork to head eastward across the forested laterite surface of the hill top. Pass a side track at ‘27’. The track bends northward just before reaching ‘28’. At that point leave the track to head ESE through quite open jarrah forest. Cross a N-S track at ‘28-1’ and descend to meet (at ‘29’) a less-used old vehicle track track at a bend. Continue ESE on this track down the steep hillside through wandoo woodland and veer right (southward) at ‘30’ to follow the track downhill via ‘30-1’ to near the corner of the adjacent farmland boundary fenceline. Veer SW onto a vague, overgrown vehicle track at ’30-2′ and descend to a gully at ‘31’. Locate an old, very overgrown track on the other side (the track is initially difficult to find due to the increasing overgrowth). Follow the remains of the track southward through low shrubland via ‘31-1’, ‘31-2’, ‘31-3’. (Despite the encroaching dense shrubland, if you follow these waypoints closely it should not be too difficult to pick out the original track underfoot and to pick the easiest way through.) The ‘track’ descends quite steeply in places and then veers left (eastward) at ‘32’ into partly open forest flanking a gully. Cross the gully and follow an animal track to another corner of the fenceline (at ‘33’) bounding the adjacent farmland. Turn right (southward) to locate and follow via ‘33-1’ an animal track which crosses another gully (stream usually flowing) through dense shrubland to meet another old and very overgrown track at ‘34’. Again this old track, though becoming increasingly overgrown, will hopefully not be too difficult to follow westward, gaining a good view to interesting weathered granite outcrops on the steep hillside across the narrow side valley. Turn left (southward) at ‘35’ to follow the old track uphill to a T-junction at ‘36’. Turn right (westward) and follow the track to its end on a broad heath-covered hill-top at ‘37’. 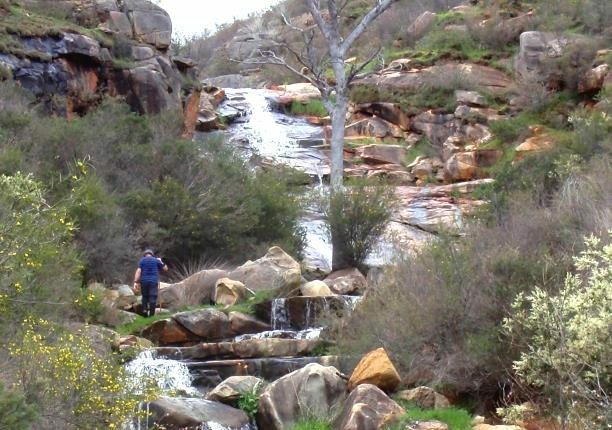 Follow an animal track for 30-40m to reach a granite slab at ‘37-1’ from where there are wide views, including westward down the lower part of the Wooroloo valley and also SE-ward across the valley to the rocky side gully and falls explored earlier in the walk. Also visit the other larger nearby outcrop at ‘37-2’. Then retrace your steps to the track at ‘37’. If time and energy allows take a short off-track diversion at ‘38’ to visit some large granite boulders (at ’38-1’) only 50m north of the track. Then rejoin the track and follow it eastward (via ‘39’) as it climbs mostly gently along a ridge, initially mainly through wandoo woodlands. At ‘40’ for an optional diversion to a nearby outcrop and view, veer left off-track and soon pick an easy way through a narrow belt of fringing shrubland to reach at ‘40-1’ a large granite slab which slopes off to the NW and from ‘41’ provides views across farmland and the side valley, toward part of the route already covered. Cross the top of the outcrop and re-enter forest. Veer eastward at ‘42’ across an open rocky clearing to rejoin the track at ‘43’. Follow the track NE-ward, taking a right fork at ‘44’. Pass a side track on the right at ‘45’. The track then descends NE-ward via ‘46’ where it meets the farmland boundary and descends more steeply. At ‘47’ it veers SE-ward more steeply down the hillside. Veer a little left at ‘48’ to leave the track and join nearby O’Brien Rd at ’49. Follow the road for 150m down the hill. 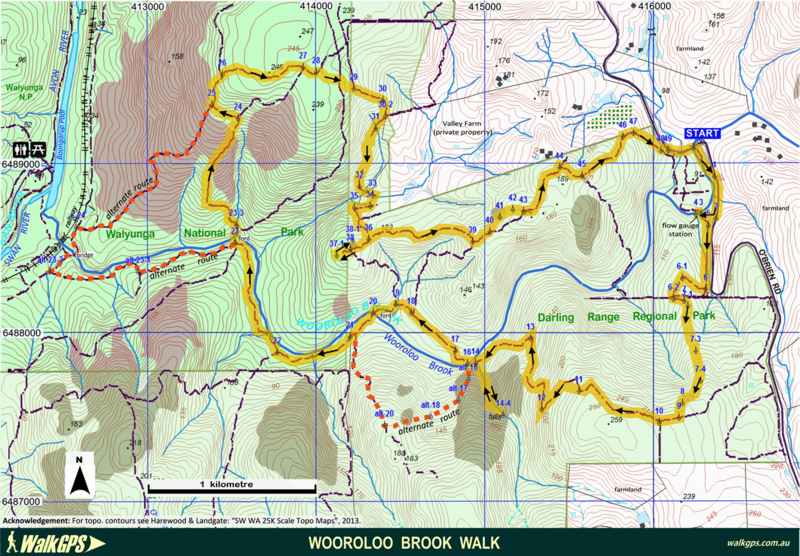 Return to the start point by turning right immediately after crossing the bridge over Wooroloo Brook. Option, to bypass all ‘wet’ crossings if Brook is flowing strongly (after waypoint ’15’): There is no need at all to abandon your walk if you find the Brook is flowing too strongly for a safe crossing at ’16’. Instead head S-ward from ’15’ away from the Brook, up the ridge through shrubland via ‘alt-16’. Cross the ridge crest to ‘alt-17’ and veer right initially along slope, soon passing through open woodland and reaching a stream course at ‘alt-18’ in a side valley. Continue WSW up the western flank of the valley to reach another ridge at ‘alt-19’. Veer right (W-ward) and meet an old vehicle track at ‘alt-20′ on the ridge. Turn right (NW) to follow the track down the ridge to meet a track T-junction and rejoin the described route at ’21’. Follow the described route along the southern side of the Brook only as far as ’23’. Bypass the N-ward crossing point of the Brook and continue along the southern side via ‘alt-23-1’. Reach a track T-junction at ‘alt-23-2’ and turn right (NE) to cross Wooroloo Brook via a bridge at ‘alt-23-3’. Continue along the vehicle track to a sidetack on the right at ‘alt-23-3′. Follow the track up the hillside to rejoin the described route at ’25’. This option increases the total walk distance by 3km to 17km. Great Eastern Hwy and bypass, then north on Roe Hwy to Toodyay Rd. Then 14km along Toodyay Rd to O’Brien Rd turnoff on left. Follow O’Brien Rd north for 14km, then turn off and park on dirt track on left immediately before the bridge over Wooroloo Brook. Alternative access via Walyunga National Park (for a modified longer walk route from near the western end of Wooroloo Brook): Great Eastern Hwy and bypass, then Roe Hwy, then 15km north along Great Northern Highway to Walyunga Road on right (signposted to Walyunga National Park, main entry). DBCA park entry fee applies. Follow the sealed road to the furthest carpark, near Boongarup Pool (approx. 3.5km from the Hwy) which is an alternative Start point. Camping at sanctioned site/s in Walyunga National Park is possible by arrangement with DBCA ranger. Facilities: Pit toilet, tables and water. Camping fee applies additional to Park entry fee. Eastward – Via tracks to O’Brien Rd. The ridge track from waypoint ‘36’ eastward to O’Brien Rd can be reached at ‘38’, ‘39’ and ‘45’ by tracks linking northward from the Brook. 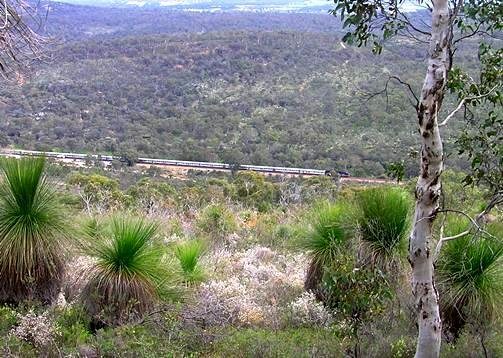 Westward – Across the Swan-Avon River via tracks down the valley to Walyunga National Park. Northward – Via ‘26’, ‘29’ etc; Less than 3km on vehicle tracks to Ewing Rd, north of the walk map area. Paruna Sanctuary – Located about 4km north of the start point of this walk. It includes some excellent on-track walks. “Walyunga National Park”, DBCA – Parks and Wildlife site. 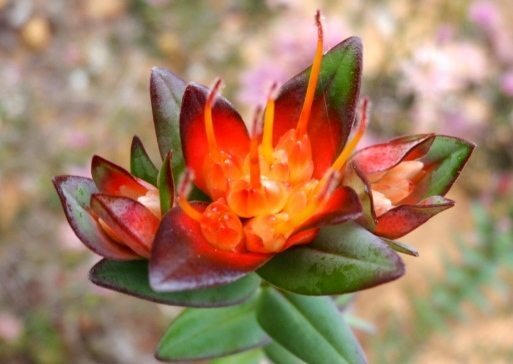 – Includes a downloadable Park Guide and Flora & Fauna Guide. WalkGPS Walyunga NP Walk – On this site. 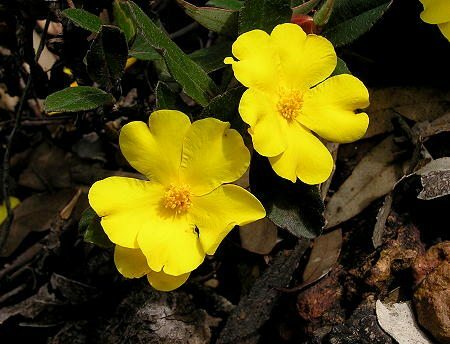 Also includes additional information on Walyunga National Park and its existing walk trails. F.R. Berry Reserve Walk Trail, Gidgegannup Community site. 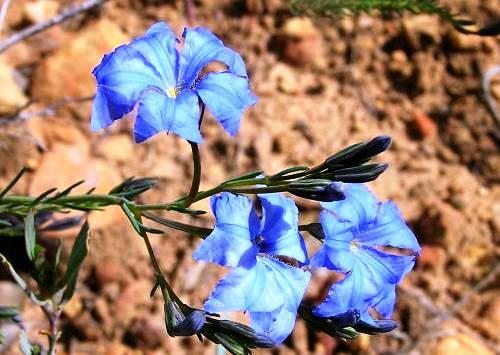 – A 2.7 km walk located 8.5km up Reen Rd from Toodyay Rd and about 4km east of the walk on this page. 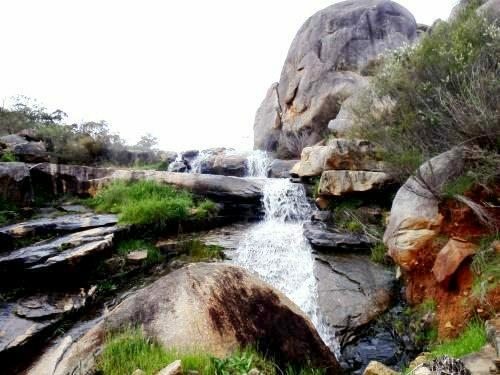 This is a worthwhile short walk which includes a visit to a lovely waterfall on Wooroloo Brook. The 214ha reserve is included in DEC’s ‘Land for Wildlife’ scheme. 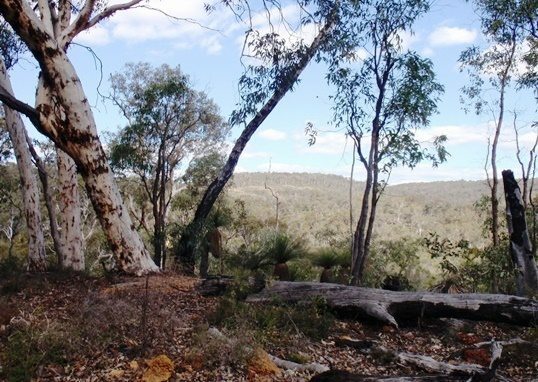 Noble Falls Walk Trail, Gidgegannup Community site. 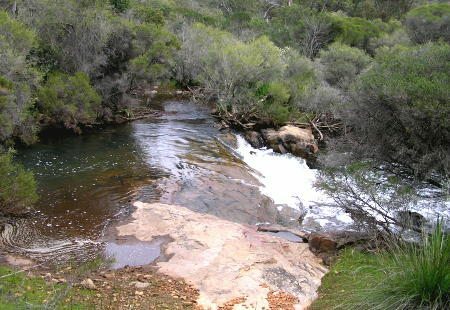 – A 3.5 km walk located opposite Noble Falls Tavern, off Toodyay Rd, about 5km NE of Gidgegannup and about 15km ESE of the walk on this page. “South West WA 25K Scale Topo Maps”, Greg Harewood & Landgate, 2015. – Digital raster; ECW format on 16GB USB. See tile #332-2134-IV-SW for relevant map coverage. One of the nicest walks around Perth we have discovered for a long time. Thanks so much WALKGPS!! I did half of this one a few weeks ago but because it took so long to get through a very fast flowing brook, we cut the walk in half up one of the exits (easy to do). The following weekend young Ross Lambert and I headed back up there to knock the whole walk off with 3 significant water crossings (TAKE CARE!) What a beautiful time of year to walk though, flowers just sneaking through, mist in the mornings – YES! If anyone’s wondering how deep the crossings will be before they get there, you can check the stage information for the Karls Ranch gauge (at ‘3′) from the public website at http://kumina.water.wa.gov.au/waterinformation/wir/reports/publish/616001/616001.htm. e.g. Last time I did this walk in September 2016, the stage level was reported at 10.400m, and we found the last crossing point at ‘23’ to be about 60cm deep. Of course, you will need to use your own judgement and take care, as mentioned on this website and in other comments. Yes, that info is included under Alerts/Issues button on this page (see sub-heading Current levels and conditions). Important to check the Alerts/Issues info before heading off on any of these walks. I kept the note from my last walk there so I knew what the depth would actually mean when it came to getting my feet wet. On that occasion, we stayed on the south side of the brook, following a foot track that was overgrown in places. Only crossing at that last point (23) around lunchtime, giving us some time over lunch to change into dry socks. 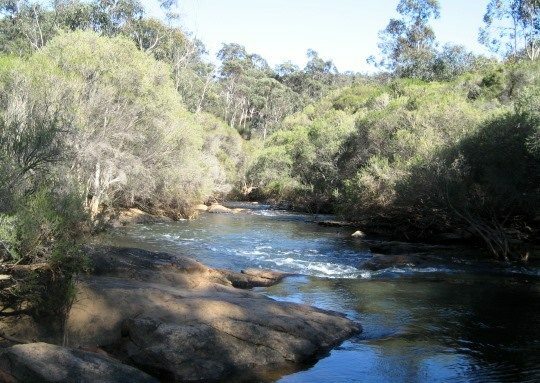 River crossings: Despite the tranquil image that the name ‘Brook’ suggests, Wooroloo Brook can rise quickly and flow strongly in these lower reaches after heavy winter rains. It can often become too dangerous to cross. The walk Route notes and map include a good option for bypassing all crossings if the Brook appears unsafe to cross. But provided there has not been recent heavy rainfall, the Brook can usually be crossed safely at the three crossing points on this walk, but cross carefully, preferably with the assistance of a walking pole and watching your footing on the often very slippery rocks. This especially applies at the second crossing point on the walk route (at ’20’) where walkers need to take care to stay safely upstream of the small waterfall and avoid slipping on the broad granite ledge. 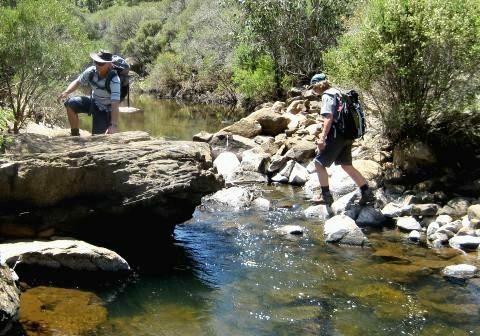 If you prefer to remove your boots for the few metres of shallow wading, pack suitable sandals with a good grip sole to change into for the crossing. 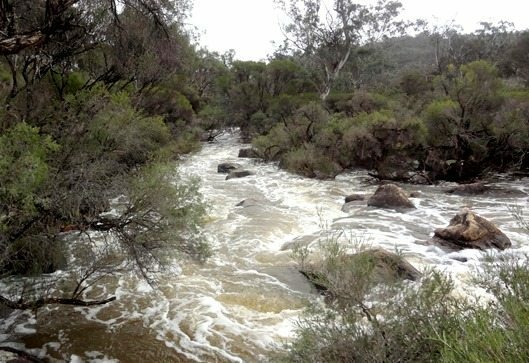 Current river levels and conditions: Some indication of the likely flow in the Brook can be checked before you start out from up-to-date charts of the river level downstream at Walyunga Pool (as derived by White Water Perth from DWER’s automatic daily updates (from Swan River Great Northern Highway or Walyunga gauge). 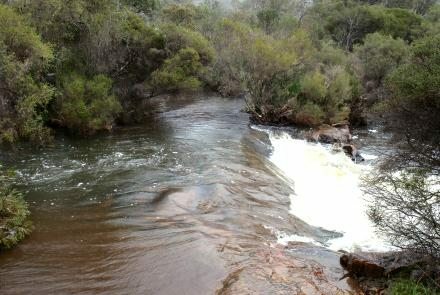 Flow information is also available from DoW’s ‘Karl’s Ranch’ monitoring station on Wooroloo Brook near the walk start point. Wooroloo Brook near start point. Granite outcrops in side gully. View down valley from above the falls. 'Sentinel' rocks straddling the side gully. Outcrop and stream in side gully. Walkers cross Wooroloo Brook (mid-Spring). 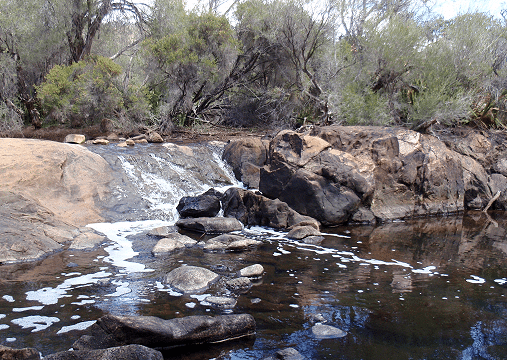 Small falls on Wooroloo Brook at a crossing point. Small waterfall on Wooroloo Brook. 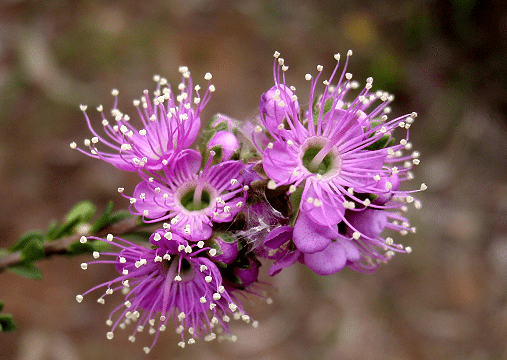 Swan River Myrtle (Hypocalymma robustum). Indian Pacific train heads north through Swan-Avon valley in Walyunga N.P. View through woodland from north side of valley.